The ability to speak and communicate with others develops naturally through listening to the communication of adults. The ability to read printed and hand written text, which is the ability of literacy, does not, however, develop in this manner. The ability to read and write can only be developed in children through teaching and active learning. For this reason it’s very important that we recognise the need for literacy in our children at a young age and take steps to imbue these skills early on in their development. Isn’t it the job of schools to teach children to read and write? The answer is of course yes, but that does not mean that schools can do everything. Literacy is one of the most important benchmarks in the educational system. Almost all educational resources are in written form and the ability to discern them is of vital importance. Almost all tests given to students throughout their education will be in written form and even listening tests require that answers are written down. Amazingly, 46% of Australians between the ages 15-74 have poor to very poor literacy skills according to the Australian Bureau of Statistics. A poor foundation of literacy not only reduces the chances for success later in life, it also increases the chances of ‘dropping out’ of school at a young age. Research has demonstrated that those students who have developed strong foundational pre-literacy skills before school tend to perform remarkably better throughout education and general life than those who lagged behind with pre-literacy skills. There is a set of key factors which have been recognised as benefiting the transition from pre-literacy to literacy in young children. 1. Language ability and comprehension. A child’s ability to talk and to comprehend both narrative and direction is a key indicator for literacy success. 2. Letter identification. Understanding the different sounds which each letter represents is a key starting point for literacy. 3. Phonological control. The ability to control which sounds are made during speech. 4. Literacy promotion in the home. Children from families with books at home and those who participate in shared reading have been shown to perform better in the transition between pre-literacy and literacy. Whilst the primary function of early school education is to develop literacy in students, studies have shown that the most significant developments are made in the home. Those homes which provide access to books, alphabet materials, crayons, paper and literacy games, tend to aid their child’s development into a literate youth dramatically. Reading newspapers together, visiting local libraries and practising the alphabet in the home are also excellent ways to assist the transition between pre-literacy and literacy. Exposure to print is very important but it does not always have to be done deliberately and intentionally. Interacting with the world around you is a great way to promote literacy. Practice reading road signs, adverts and package labelling. Teaching literacy in this manner will help your child to learn about the world whilst also practising their literacy skills. 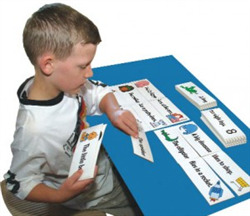 Language games are an easy way to help your child to improve their communication, vocabulary, awareness and literacy. Playing games like ‘I Spy’ will help your child to understand the need for written identification and it will help them to develop a greater understanding of the world around them. The greatest progress in childhood literacy will come from the development of their skills within the home. Spending quality one on one time with your children to help them develop their literacy skills is an excellent way to improve their chances of success in the future.